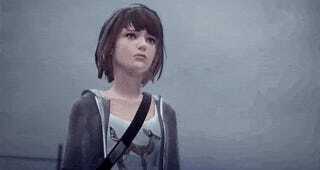 When I finished the second episode of Life Is Strange, I put the controller down, and considered playing the episode again. I didn’t want to live with the choices I’d made. One of the more important subplots in the second episode involves Kate Marsh, a religious student at Blackwell Academy who’s constantly being picked on. You have the option to befriend her in a variety of ways, but your choices become much more important this time around, as news spreads of a viral video involving Kate making out with a bunch of random men at a party. You eventually have to return a book you borrowed from Kate, and it becomes obvious how traumatizing the video has been for Kate. She desn’t remember much about that night, and while the person in the video is her, she doesn’t recall making those decisions. It’s not like her. It seems pretty obvious that Kate was drugged, and the player’s asked to recommend what Kate should do next: talk to the police or dig up more information. In my story, I told her to wait. Given this is a game about mysteries, I figured being offered this option would mean I was bound to learn more. If we could find concrete proof she’d been drugged, maybe we could send that creep to jail. She reluctantly decided to follow my advice. You spend the rest of the episode contemplating why the hell you’re suddenly able to rewind time, occasionally catching a glimpse of Kate struggling to keep it together. Clearly, she’s not doing well. It’s not long before another student leaps into your photography class and declares something’s going on at the girl’s dormitory. This is when you realize this episode is about to get messed up. See, that’s the hook of Life Is Strange: you can rewind time. But the second episode reveals there are limits to Max’s power, and she can’t warp the time-space continuum without consequences to her own health. In her desperation, though, Max finds another power, and is able to freeze time before Kate walks off the rooftop ledge. When she reaches the top, though, she’s exhausted. There’s no more experimenting, and this conversation will be the only one. Earlier in the episode, it’s possible to poke around Kate’s room and learn how her family is reacting to the viral video. As you might expect from a religious family, sexual promiscuity is not exactly encouraged, and she’s being shunned by those she loves. It’s why Max is so important. How much you remember about what you saw in that room is critical to what happens next. You need to remind Kate she’s loved, and there are reasons to live. There’s life after a bad viral video. Kate walks off the ledge, and she’s alive. That is not what happened in my game. I didn’t choose that option. I chose her mother. Unfortunately, her mother hates her. Kate didn’t take this well. Kate commits suicide, and there’s no going back. She’s dead. I nearly spit my coffee out when this happened this past weekend. I’m used to games introducing choices where the player is given agency over life and death, but it’s usually a situation where you can’t really fail or you’re just considering one bad option over another bad option. In this case, my memory failed me, and I could have saved Kate’s life. But I didn’t. For a while, I figured this was how it was supposed to go. “A-ha, the game is giving me the illusion of choice, and you were supposed to watch Kate die, no matter what.” Of course, that’s not true. You can save Kate, and based on the stats displayed at the end, lots of people did. When I vaguely remarked about this on Twitter, the responses I got were really interesting. 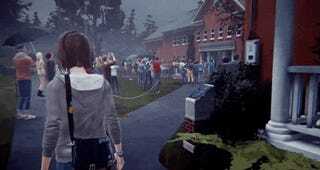 People told me how they couldn’t live with Kate’s death, and actually reloaded the game. I’ve never done what these players are suggesting, even when it’s gut wrenching. I find it more interesting to cope with the consequences of your actions, even when they go completely awry. 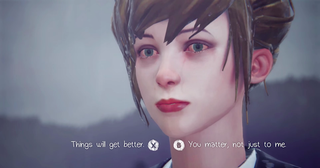 It’s not often that games kill off characters, and since Kate’s death is optional, it’s all the more impactful. I wanted to save her, but even my super powers weren’t enough. 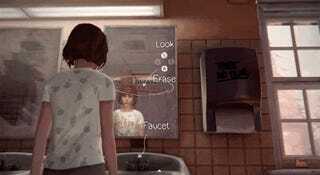 That’s part of my story through Life Is Strange, and altering that with a new save doesn’t feel honest to it. Kate Marsh is dead. I have to live with it. Can you?